Heat the oil in a large heavy skillet or deep fat fryer. Mix ingredients together and drop by tablespoon full in the hot oil. Cook until golden brown and drain on paper towels. 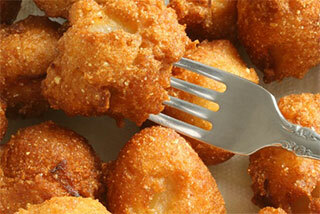 For more hush puppy recipes, please visit MissHomemade.com.